Although more than 380 years separate Bernini’s Baldachin (1634) located in St. Peter’s Basilica in Rome and Damien Hirst’s The Diver (2017) – a female bronze statue from “Treasures from the Wreck of the Unbelievable” at the Venice Biennale – it appears that they are folded together as living art. James Lees-Milne, an architectural historian writes, the “baldacchino is enchantingly deceptive,” while Gilles Deleuze speaks of “severing the facade” from the inside, and Jose Antonio Maravall conveys the Baroque reveals a “divergence” from the Renaissance and that by the first half of the 17th century, the Renaissance spark of light was already going out. Within the context of these two works of art, we can examine the notions of enchanting deception, the language of the facade, and the divergence of light. Today, The Diver is currently not aware she is preparing to dive into the light - of the Baroque. 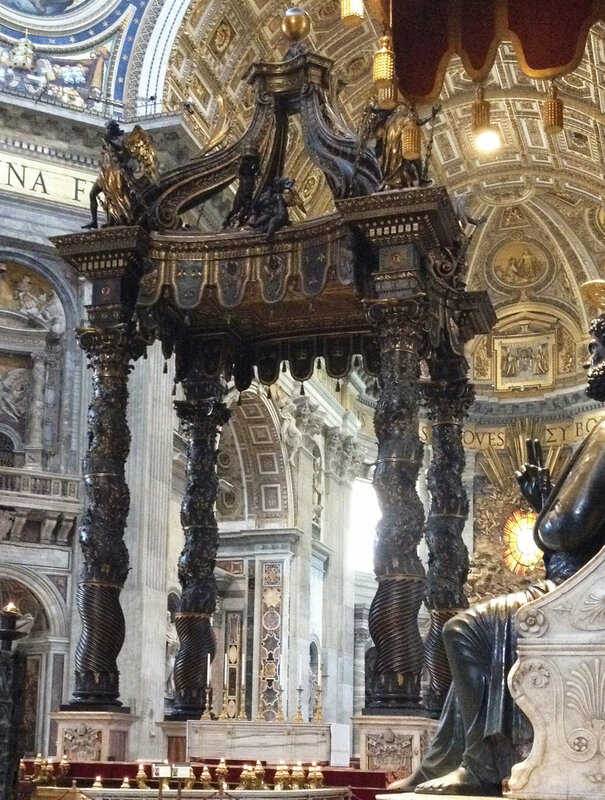 While the Baldachin was intended to mark the location of Saint Peter’s tomb at the intersection under the dome, it simultaneously fulfilled Pope Urban VIII Barberini’s wish to fill the “empty” space below the dome and to create an upward movement. While standing at “C” of Room 1, The Diver is objectified as a relic of an (underwater) tomb, at the intersection of the former Sea Customs House (1682) and the Grand and Giudecca Canals. She fills the empty space in a museum room where the viewer’s eye visually follows the diver’s upward motion. The viewer’s eye movement is dramatic for both works of art. One’s eyes sweep up beyond the height of the Baldachin canopy toward the ocular light in the dome, while similarly one’s eyes cast upward beyond the poised raised hands of the diver toward the ocular surveillance cameras. As one wonders who the eye in the sky really is, Deleuze’s mention of the sensation of a somatic moment of total isolation and dispersion, comes to mind. The enchanting deception lies (or finds truth) within the form. The Baldachin columns are feminine in form as the sensual shape of the decorated twisting columns rise to a canopy of detailed ornamental tapestry. The sensual shape of the diver stretches in physical kinesthetics enveloped in decorative encrustations from a sea world. The contradiction of illusion and Maravall’s “spirit of disillusionment” are embodied in both works. Through the bee emblem (logo) of Pope Barberini as well as the missing head of the female diver, the materialistic recognition desired by the Pope and mindlessness of the figure are Baroque metaphors alluding to disruption - of the sensible. While, the architecture’s exterior facade severs it from the inside, there is a distinction between exterior and interior spaces relevant to both the church and museum. By stepping over the threshold, one passes into the interior’s architectural “sacred” space. The Baldachin informs The Diver how not to engage with the secular. Embodied in both works of art, are the divine rights to be touched by only the select few with proper authority. The traveler or viewer remains virtually on the exterior facing “do not touch” signs. One feels the tension of authority and freedom, and recognizes, as Maravall states, Baroque’s “basic problem.” Additionally, the sculptural facades cause the eye to confuse different sensational orders of space and surface and sever the exterior from the peaceful interior void of the bronze castings. While the dome above the Baldachin has clerestory windows, the Sea Customs House (Punta Della Dogana) contains evenly spaced windows on the ground level. During the Renaissance, light meant supernatural, theology, or truth within the church context. The light of the museum comes in from the side and is not raised to the height of theology, but remains on the level of pedestrian doubt. The dramatic spotlights shining on the “treasures” serves to blind the viewer, diverging thought and personal reflection, as one must look away. Literary narratives speak to the divergence of a trajectory. While the church conveys, due to the fall, we are not free; historically Deleuze’s “mystical experience” remains elusive in definition and does not conclude if we have truly passed from slavery to freedom. Although Amaton was a freedman, his own vessel of passage failed to meet its destination. Within the “Treasures from the Wreck of the Unbelievable” we wonder if the narrative is a divergence for Damien Hirst just as Deleuze identifies with the past to confront political and ethical issues of the present. Bernini has informed Hirst in the curves and twisting folds of sculpture both literally and metaphorically. Within the context of cultural consciousness, travelers are placed in a precarious position. Exterior to the sculpted forms, travelers experiences a divergence of logic; voices ebb and flow uttering belief or disbelief in the narrative of living art.